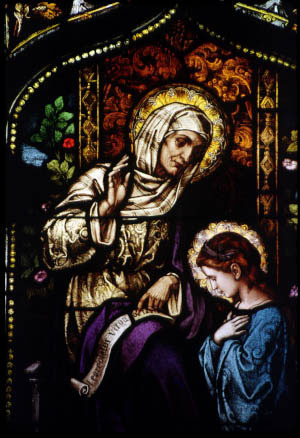 St. Anne and her young daughter Mary are portrayed in one of five transept windows at St. Mary Cathedral depicting the early life of St. Mary. In this window detail, young Mary learns to read at the knee of her mother, St. Anne, who points to the Latin text for the scripture, "Behold, a virgin shall conceive." Mary is shown wearing a blue gown and star-rimmed halo. Other symbols of Mary in the window include the red rose and the fleur-de-lis or lily design of her gown. St. Mary also appears in the other series of windows at the Cathedral, pictured either in person or through the symbolism of the rose. St. Mary Cathedral was designed by architect E. A. Bond of Lansing and completed in 1913 as St. Mary Church. Its clear windows were replaced in 1923 by stained glass windows made in Munich, Germany, by an as yet unidentified firm. In 1937 the church was designated a cathedral. Major changes have included architectural renovation by the firm of Mayotte-Webb Architects and interior design by Robert Rambusch. St. Mary Cathedral of Lansing was registered in the Michigan Stained Glass Census by Bill Heater of Lansing. Text by Betty MacDowell, Michigan Stained Glass Census, May , 1998.